There is no clinic in the whole of Canaan, a IDP camp of somewhere between 60,000 and 200,000 so for this group of women, members of Aide Humanitarian, Sunday was a special day. 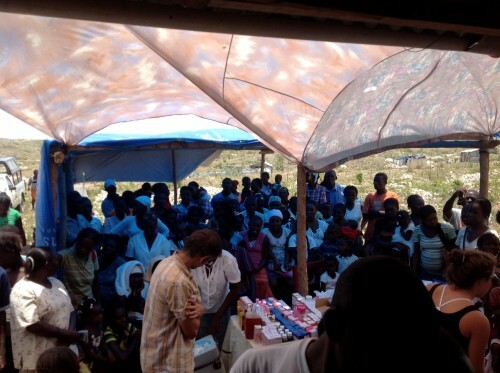 The first tasks was registration and then on to receiving patients and handing out medication. 7 nurses attended 48 children 90% who had infections, flu and malnutrition. Of the 40 women who came, the majority had vaginal infections and many also had eye infections from the dust plus 4 women were pregnant. It was really an amazing day. None of the women or children would otherwise have received treatment and even if they could have afforded to pay it would have taken them hours to reach the nearest clinic. Over 300 women came on Sunday to attend the clinic and due to the nature of the illnesses, Rea and the other volunteers will try to return next weekend with another clinic.